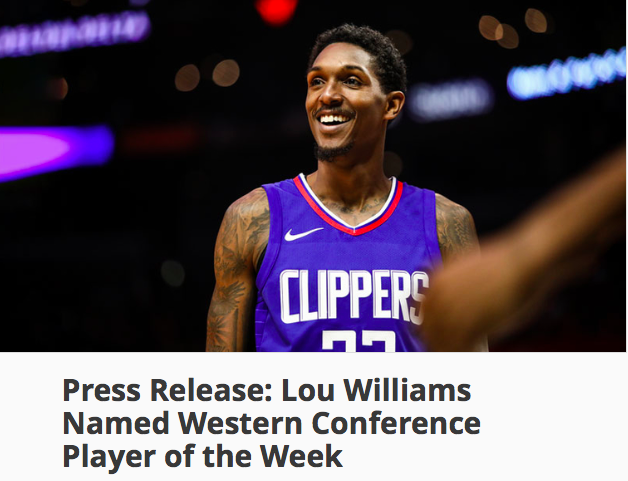 Lou Williams Named “Western Conference Player of the Week” and Lands the Position of Leading Reserve Scorer in the NBA! The National Basketball Association today announced that L.A. Clippers guard Lou Williams has been named Western Conference Player of the Week for Week 11 (games played Monday, Dec. 25, through Sunday, Dec. 31). Williams won his second career Kia Player of the Week award by helping the Clippers to a 3-0 week behind averages of 28.0 points and 4.7 assists and shooting splits of 50% from the field, 48% from three-point range and 87% from the free-throw line in 31.4 minutes. He reached the 40-point mark for the fourth time in his career in leading the Clippers to a 106-98 win over the Hornets on New Year’s Eve, the largest scoring effort by any reserve since Williams last scored 40 off the bench on Dec. 5, 2016 vs. Utah as a member of the Los Angeles Lakers. Now in his 13th NBA season, Williams is averaging career-highs in points (21.4), assists (4.8), three-point percentage (40.8%) and minutes (31.2) this season. He is currently the NBA’s leading bench scorer, averaging 21.2 points per game as a reserve, the highest scoring average of any bench player since Ricky Pierce averaged 23.0 points per game as a reserve in 1989-90.